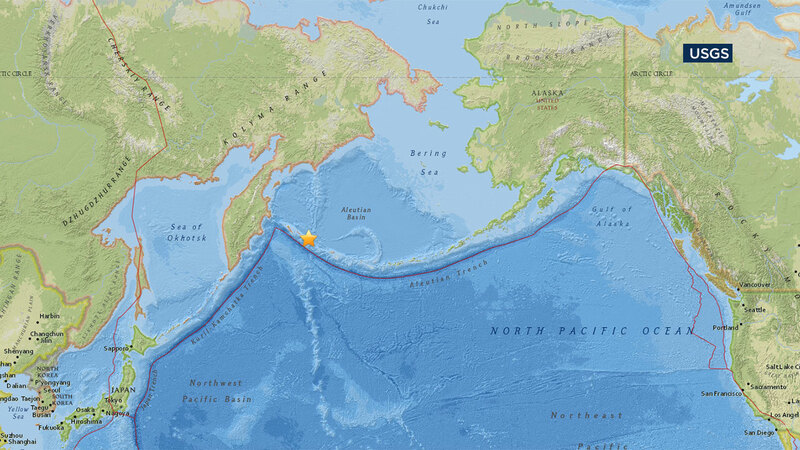 A 7.7 magnitude earthquake struck in the North Pacific Ocean just east of Russia, triggering a tsunami warning for that nation's coast. Officials said preliminary info indicates there is no tsunami danger for the U.S. West Coast or Alaska. The earthquake hit near the Komandorskiye Ostrova region of Russia. It was centered in an area near the Bering Sea and the North Pacific Ocean, off the coast of some sparsely populated islands. The quake was initially estimated at 7.4 but USGS revised its estimate to 7.7. Tsunami waves were possible for coasts within 186 miles of the earthquake epicenter, officials said. The National Tsunami Warning Center in Palmer, Alaska, later canceled the advisory because the tsunami no longer posed a threat. Officials at the warning center had cautioned waves could reach up to 3 feet above the tide level. But waves later Monday were reported only 6 inches above tide at the sparsely populated Shemya, Alaska, site of a remote Air Force station in the extreme western Aleutians.